With the NBA season just around the corner, New York Knicks superstar Carmelo Anthony is making noise, not because of his stellar skills, but because of the new edition of his eighth signature model with Jordan Brand. The Jordan Melo M8, which has constantly hit strides every release for the past few months, is now available in Anthracite/White – Varsity Maize colourway, which is a part of the Jordan Brand Varsity Maize Pack this Holiday Season. The silhouette features Varsity Maize patent leather on the upper part combined with Flywire laced midsole and Varsity Maize laces as well, creating a stunning look that will surely turn a lot of heads. This one is now available so make sure to get one! 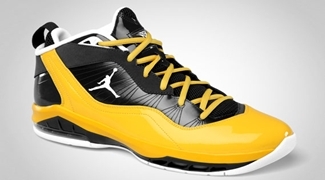 Two Jordan Melo M8’s to Make Splash This December!